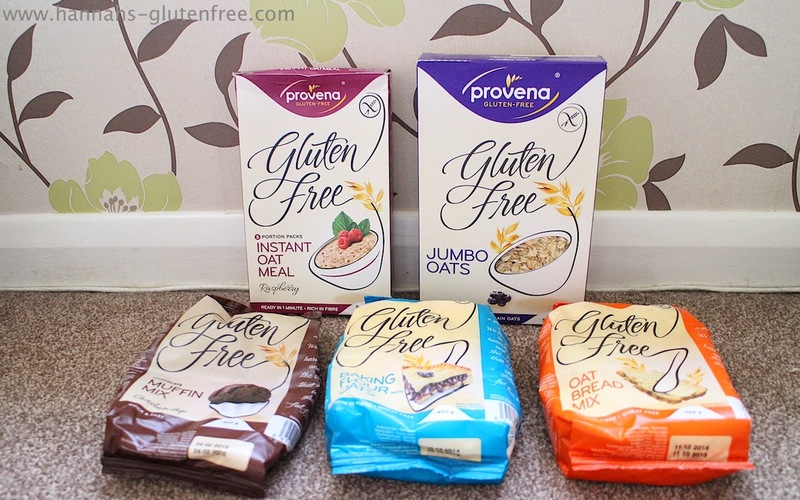 Hannah's Gluten Free : Provena Gluten Free Haul! Last week I received a box from Provena. Provena is a Finish company which will be available here very soon! Their product range of mixes to bake and oat based products is very intriguing to me, as I love to bake but sometimes you want to have a quick bake without having to weigh out too much! I will be reviewing each product, but for now I thought I would show you what I was sent! This box contains 5 pre portioned sachets of oatmeal. Very much like every other instant porridge/oat product, all you have to do is add your choice of milk or water, microwave and hey presto! A hot bowl of oat goodness! As it says on the box these are just oats, so perfect for making granola, topping yoghurts, making porridge, or as they suggest on the box use them to top an apple crumble! Yum! This box of oats is so versatile and is a staple in any cupboard. I have found a Finish website that sells these oats for almost £5 but I am not sure how much they will be from Provena themselves. Another gluten free chocolate muffin mix! These are always a hit with me as I am a bit of a chocolate lover. I enjoy baking my own so I can make them into smaller snack sized cupcakes as a muffin or cakes in general can sometimes be a little large for me, I much prefer to have the choice to eat a couple, than struggle through one. I am looking forward to baking this! I am very apprehensive about this product as I have only done a bread mix once before and I made a complete mess of it! I am clearly not a talented bread baker, but practice makes perfect and it does not look too tasking! Famous last words I know... But there is only one way I will get better at it. So lets hope I can create a somewhat presentable loaf from this mix... we will see! Another great thing to have in the cupboard, I do enjoy baking when I get the chance so I always keep flours, sugars and flavourings in my cupboard. I have a new gluten free baking book which has some recipes calling this flour's name!